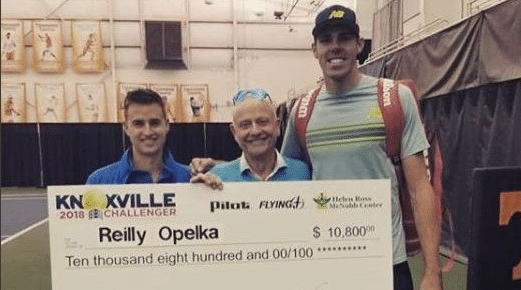 Orlando’s Reilly Opelka won the Knoxville Challenger, and the Niceville (Fla.) $150,000 Futures event crowned a teenage champion last weekend in USTA Pro Circuit play. Opelka, the No. 8 seed at the $75,000 event in Knoxville, remained perfect in career ATP Challenger finals, winning his third after a 7-5, 4-6, 7-6(2) victory in the championship against fellow American Bjorn Fratangelo. It was his second ATP Challenger win of 2018 after Bordeaux, France in May, and followed his first in Charlottesville, Va., in 2016. The 7-foot Opelka, who turned 21 in August, has been sidelined with varied illnesses and injuries in 2018, including mononucleosis in June. He rose to a career-high No. 116 on the ATP rankings this week. Fratangelo in his semifinal beat unseeded fellow American Chris Eubanks, while Opelka topped unseeded Nikola Milojevic of Serbia. In the all-unseeded doubles final, former Tennessee Volunteers Tennys Sandgren and Hunter Reese were beaten 7-6(6), 7-5 by Toshihide Matsui of Japan and Frederik Nielsen of Denmark. 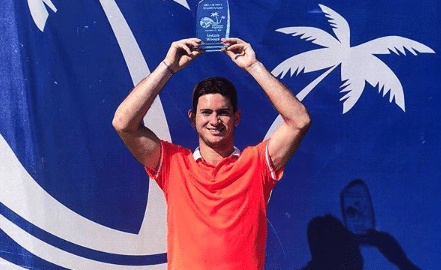 Niceville hosted the Bluewater Bay Men’s $15,000 Pro Circuit Championships, where unseeded 18-year-old Nicolas Mejia of Colombia won his first USTA Pro Circuit title. The 2018 Wimbledon juniors doubles runner-up and an IMG Academy student in Bradenton, in the final Mejia defeated American and No. 2 seed Strong Kirchheimer, a former Northwestern standout, 6-4, 6-4. Mejia in the semis toppled No. 1 seed Fabrizio Ornago of Italy 6-2, 6-4, and in the second round he upset No. 3 seed Juan Manuel Benitez Chavarriaga of Colombia 6-4, 6-2, failing to drop a set through the tournament. In the first round he defeated former USTA Florida “Bobby Curtis” Junior State Singles Boy’s 16s champion Logan Zapp of Fernandina Beach, Fla.
Americans Trevor Allen Johnson and Patrick Kawka captured the doubles title in Niceville, in the final defeating the Irish-American pair of Julian Bradley and Justin Butsch 7-6(5), 6-4. With more than 90 tournaments hosted annually throughout the country and prize money ranging from $15,000-$125,000, the USTA Pro Circuit is the pathway to the US Open and tour-level competition for aspiring tennis players and a frequent battleground for established professionals. Andy Murray, Maria Sharapova, John Isner, Sloane Stephens, Kei Nishikori, Victoria Azarenka, and Sam Querrey are among today’s top stars who began their careers on the USTA Pro Circuit. For more info go to www.procircuit.usta.com.